WHAT ARE THE POSSIBILITIES FOR KIDS? When Jesus’ teachings on love, trust and obedience are taught. Where faith in Jesus turns lives away from sin and toward God. WHAT IF? … You had a curriculum that taught kids the practical spiritual truths that inspire them to seek a personal relationship with Jesus? A relationship where they fully trust Him and turn to Him for the answers to all their questions. The kind of relationship where Jesus is truly their Lord and Savior. A relationship that brings about tangible and positive change within them. Which in turn, will affect the people around them in a positive way that leads them to Jesus too. 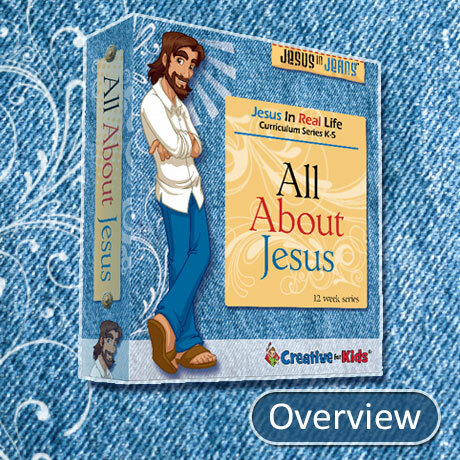 JESUS IN JEANS™ shares Jesus' life and teachings with kids, K - 5th grade, in a relevant way that will help them relate to him and apply his truths to their everyday life. Based on Luke 2:40 "There the child grew strong in body and wise in spirit. And the grace of God was on him." our goal is to include everything kids need to grow strong in body, live wise in spirit and enjoy God's grace in everyday life. What an amazing witness they would be for Christ if we partner together to reach that goal! 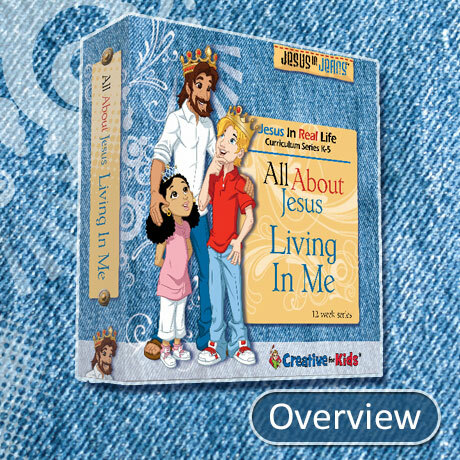 Michele Triplett, Editor of Jesus In Jeans, explains the purpose of Jesus In Jeans Curriculum, why Jesus is in jeans, the 3 learning experiences each lesson is written around, and how each lesson is structured. We’d rather give you too much content than not enough. So we’ve designed the lessons so that you can include the important stuff first then add optional activities as time allows, based on the length of your service. If time does not allow you to include the entire lesson, you could teach the optional sections during the midweek service (if your church has one) or as a small group during the week before or after the main lesson is taught. All About Jesus Qtr. takes kids on a journey from Jesus' birth all the way to His resurrection. It addresses daily struggles and temptations kids face and teaches them to look to Jesus for help and answers. All About My Bible Qtr. 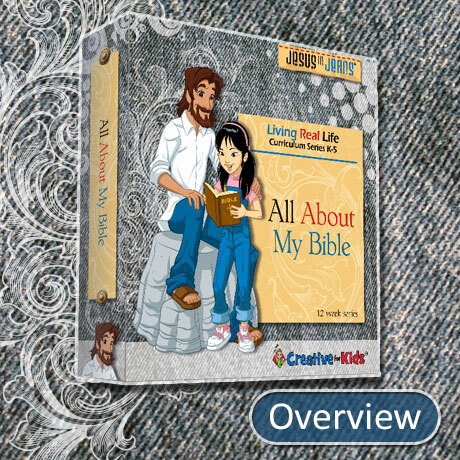 focuses on helping kids K - 5th grade understand how important their Bible is. In month one they will discover God's incredible story. In month two they will begin to understand why God wrote His story down. In month three they will be encouraged to make God's incredible story a part of their everyday life. 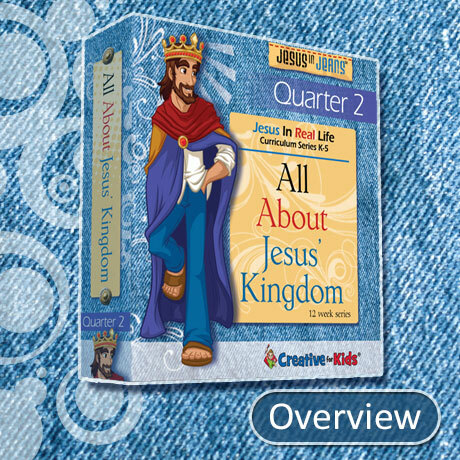 All About Jesus’ Kingdom Qtr. takes kids on a journey through Jesus' kingdom. It reveals Jesus as the King of kings and describes the kingdom he rules. 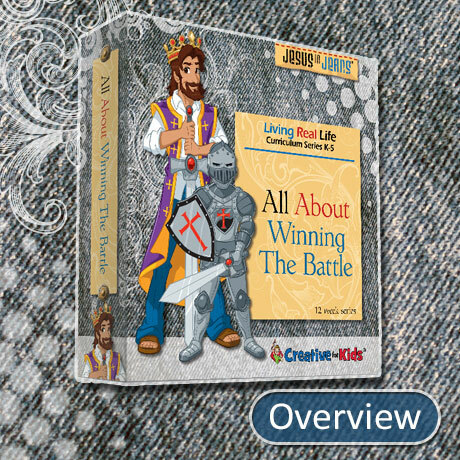 As kids embark on a journey they will meet Knights, Archers, and other characters that will challenge them to choose between taking the wide road to a worldly kingdom or choosing the narrow gate that leads to Jesus' Heavenly Kingdom. All About Running The Race Qtr. 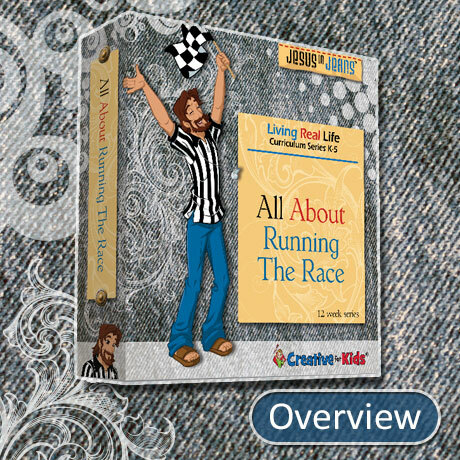 focuses on the life of the Apostle Paul and how he ran his race. In month one they will learn how to train wisely for the race. In month two they will find out how to run with endurance and integrity and how to choose the right kind of training partners. In month three they will be encouraged to run to win, cross the finish line, and claim the prize. All About Jesus Living In Me Qtr. invites kids to take a tour of KidsTown. Each resident’s behavior both good and bad, will show kids importance of letting Jesus live in us. 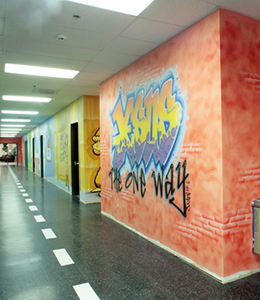 During the tour Kids will be encouraged to apply Jesus' teachings to their everyday choices and actions. As they choose to do this their focus will no longer be on them living for themselves, it will be on letting Jesus live in them. Our Bible tells us to fight the good fight of faith, stay alert, and to know where our helps come from. When you teach, All about Winning the Battle, you will help kids learn that Jesus has already won the war, how to recognize the devils deception and lies, and how they can stand firm in their faith and not loose everyday battles they face. 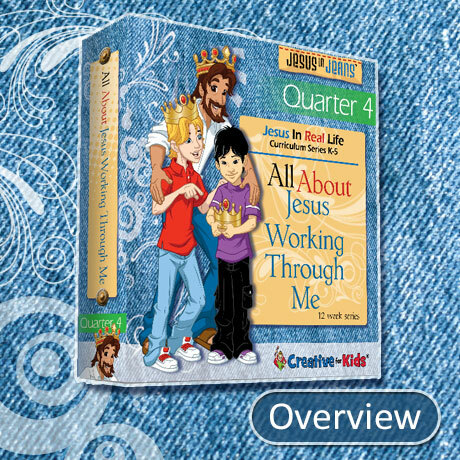 All About Jesus Working Through Me Qtr. focuses on what Jesus wants to do through us as we allow Him to live in us. It takes kids through a "Search and Rescue" training course with Mr. Reece Cue, where they discover the joy of rescuing those who are searching or lost. They will learn about gadgets and techniques and how those can also apply to the greatest search and rescue mission of all! Before Jesus went to heaven He promised to send us a very special helper to fill our hearts with His love (Romans 5:5) . 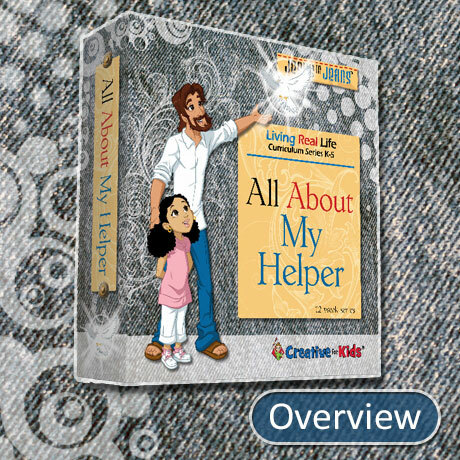 Help kids learn more about their helper, show them how He leads them in God's truth, and helps them understand why they should listen to Him and surrender to His direction, based on the Bible.